Moving Our Stuff Out This Weekend!! Boy, things sure do go fast once you put your mind to things. Just over over 3 weeks ago we decided it was finally time to move to a new area, and then almost 2 weeks after that we find and lock in our new place – and now, 2 more weeks later, it’s time to move out! So cool how quick it’s all going! Needless to say it’s going to be quite the busy few weeks here. But all things that get us closer to our end goal of living a more fun and exciting life!! This time next month I’ll be down the street at our local coffee shop mingling with the locals and explaining how people blog for a living ;) And maybe even get some new beer friends too? I could use some of those again… been out of the social scene for quite some time. Maybe I’ll even join a nerdy coin club too! Woo! Packing up everything *ourselves* – savings of around $1,000. We briefly considered hiring a crew to come in and take care of it all for us, but a) we can easily do it ourselves, even though it’s annoying and b) we had to sort through everything anyways because our goal was to get rid of 1/3 of all our stuff. Which I believe we just about did! Half of it all donated to The Salvation Army (yeah tax write off! ), a quarter of it sold on Craigslist (yeah extra money!) and the rest all into the trash. I can’t begin to tell you how GREAT that feels already – we’re so much “lighter” now! MOVING everything *ourselves* — Savings of $1,500. This one took more convincing for us to decide on, but at the end of the day we agreed that it’s better to put in the hard work and sweat now for a couple of days rather than cough up an additional $1,500 that we’ll be needing for our home renovations coming up. So we rented two 1-way U-Haul trucks (we’re dividing it up into two separate trips) and then took advantage of their current “1 month’s free rent” offer at any of their storage units :) Which only come with 1-way rentals. 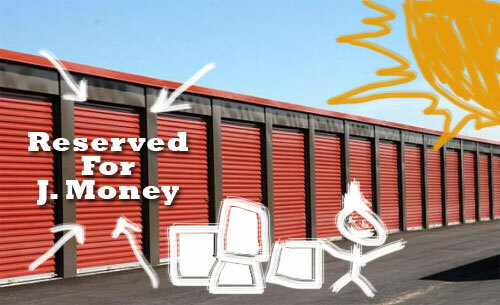 Activating that FREE month’s worth of storage unit — Savings of $180. See above . Everything’s moving along nice and smoothly so far :) Makes me a tad bit nervous that we’re forgetting something or we’re gonna stumble across some major road block here, but for now we keep pushing forward and inching closer to our mission: Getting our adventure back. I’ll be blogging about all our renovation plans/costs, and where the heck we’ll be living for the next couple of weeks here in a bit, but right now it’s time to finish things up and then get the hell outta here… Clock is a tickin’! We are in the process of selling out home, but we are seriously considering renting it out and buying a new home. Is this what you did? I am not quite clear (maybe I missed a post a few weeks ago?) Anyway, I can’t wait to go through all of that. We probably wouldn’t consider hiring anyone to move our stuff as we are pretty frugal and have lots of friends and family that would help. Enjoy the new place! Why not just wait it ou in your current home? Do you need to move to a new location for a specific reason, need more room? We’ll be updating all our floors in our entire house, plus our kitchen (and some painting), so we figured it would be a lot easier to be out completely while it’s all being done than trying to work around it with both a baby in the house, and me physically working from home. good luck with the move! that is a lot of savings but a pretty tedious process overall. Thinking about the next step is exciting though! This sounds exactly like our summer last year. We had the same random month or two that we couldn’t move in and needed to put it in storage temporarily which meant moving every last one of those stupid boxes and awkward pieces of furniture twice… I don’t envy you. BUT, moving is always exciting. The one or two miserable days are usually worth the excitement and change in the end. We also went the self-moving route and saved a ton of money. After every move, we always tell ourselves, “Welp, that’s the last time we’ll do that on our own. Next time we’re going to hire movers.” Six years and just as many moves later, we still can’t get ourselves to fork over that money for a few hours of sweat labor. Best of luck Money clan! I moved once without movers, and once with. They may be expensive, but I will be paying someone to carry my furniture from now until forever. I just finished moving a few weeks ago. I did use movers for the first time but found myself packing and moving most of the things before they were scheduled to come. Save us a lot of money even though they tried the we have a four hour min crap. Not happening. Good luck with the move and with the savings. This weekend is the pre-teen’s bday so lots of fun. Hopefully the rain stops. That’s a good idea. If we ever hire down the road we’ll probably do the same thing with packing a lot up and getting organized so it saves tons of time/effort for the crew (and thus money). The sucky part here is that we not only have to load/unload once, but TWICE! man…. Eek! Sounds like crazy times over there. Can’t wait to hear more about your reno projects, etc. Good luck this weekend! Good luck with the move J! Can’t wait to see those renovation plans…I don’t watch DIY and HGTV because I have too! Packing often saves the emotional toll of worrying about adequate jobs; we have had awful experiences with company shippers. Congrats on the move! I sold my home last week after only 10 days on thearker so i had to do the same as you now. I had already declutter and staged my home so I rented a truck and packed most things myself and with a couple of friends moved remaing to a 5×5 storage. Good luck with the move! I’m moving this weekend as well, but into an apartment, so hopefully it will only take a few hours. We have been transporting boxes and small things, so it’s mostly just furniture at this point. Still not really looking forward to it, but it’s exciting to finally have my own place. I’ll definitely be interested in your plans to renovate! Sounds like an action packed weekend ahead of you! Hopefully everything settles in alright and there’s no crazy bumps in the road. Haha, yeah – cuz we gotta load it all up and then unload it all later!! Lots of work for sure, but pretty cool you have your own truck :) I’m guessing you’d probably need to rent a larger one when it’s time than make another 15 trips, eh? well we kind of all have trucks out here so we might just get a team together. My dad and brother have one and so do my father-in-law and brother-in-law. Plus my dad owns his own company and they have a delivery truck so there is that option if its available when we move in. I’m confused – why are you putting your stuff in storage for a month? Wouldn’t you want to put it in the new house you are moving to? Unless you plan to rent out your house as furnished and are putting it in storage for a month while you do rennovations, this seems kinda silly to me. Oh, I re-read that you’re staying somewhere else for a month, I guess while you do the rennovations? Looking forward to hearing more about it. Have you actually repriced your house recently? The season I ask is that the housing market has really heated up over the last 6 months & you might be at break even on your house & not even know it. It might be worth looking into one last time before you sink $, time & effort into renters. Good luck with the moving! That’s always the least fun part. I can’t wait to read about your living situation and renovation plans. We’re going through a renovation now, and oh my, $$$…never stays within a budget! There is nothing fun about moving. Maybe the excitement of a new place, but that is about it. I just helped a friend move into his first home and I was glad that it wasn’t me moving. Good luck with it J Money! Have fun! I moved last year and it was exciting and tiring at the same time. Can’t wait to hear more! Searching and looking for a place to move in is the hardest part. The second hardest is moving to the new location. Great plan. Good savings.. BUT do you take into account what your time is worth? Calculate your hourly wage, multiply by the hours that you put in packing, tossing, selling on Craigslist and moving to really calculate what the move costs. Your time is worth something too. Oh, believe me – we’re accounting for that one in our *renovations* we’re about to do this week ;) The moving stuff is fine as it just sets me back a little while with work and what not, but the floors/kitchen/painting is a whole other thing… Will be blogging about there here real soon. Wow, you guys move quickly! I’m impressed! I never, ever pay movers. Both my partner and I are big DIY movers. We’ve had to move a few times in the past few years and while it’s a lot of work to haul stuff back and forth, it’s worth it. You can save a ton of cash. We moved everything ourselves last time too and it took forever. I don’t know what we would do next time. The missus said we’re not moving anymore though so maybe there won’t be a next time. Hope you get through it ok.
NEVER? I don’t even think I could comprehend that, haha… I’m on move #25ish or something crazy like that, and don’t think I could stay in one spot forever ESP if someone told me that :) Now, if it happened to work out that way for some reason that’s totally cool, but knowing it’s permanent from the get go would just freak me out way too much. Awesome savings! Hope y’all have a great time in the new place. Really great news! Preparing for this new step in your life is clearly exciting and for some reason I feel the joy and excitement you are feeling. Maybe it’s time for us to move somewhere new too, it’s also been 5 years now since we’ve been in the same place and we are starting to get itchy feet. But again, congrats on finally doing this and on the great savings! Previous post: Side Hustle Series: I Wash Cars!